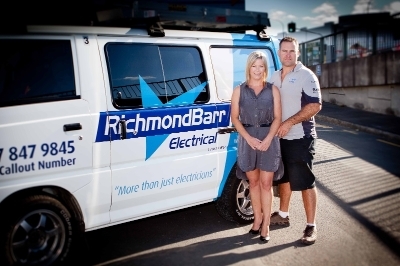 Company Profile | RichmondBarr Electrical Ltd.
RichmondBarr Electrical Ltd is a third generation electrical company servicing diverse clients throughout the Waikato. We have 2 company Slogans that we believe sum up "RichmondBarr "
RichmondBarr Electrical "Finding Solutions for your Electrical Problems"
RichmondBarr Electrical "Raising the Barr in Electrical Service"
Our Vision is to provide our customer with the "Best" possible Service, while providing "Robust Electrical Solutions"
Mike is a Qualified Registered Electrician with over 24 years experience within the industry & is the managing director of RBEL. Training as an industrial apprentice has given Mike a large number of skills within the industrial commercial sectors of the business. As well as being IQP qualified for emergency lighting , Clipsal Cbus Certified, & Control 4 Qualified, Mike has a strong interests with industrial process control & automation as well as audio visual & automation of large residential projects. Mike is also an active member of the local branch of ECANZ & Master Electricians. When not at work you'll find Mike out on the water diving & boating with his family in the summer months & over the winter is heavily involved with Suburbs Junior Rugby coaching his son Jame's team. Sarah is the lady that has to balance all the books & keep Mike in line, As well as being a mother of 2 children she has an active role within the company as the Director of Finance for RBEL. Sarah's main roles are invoicing & financial services within the company. When Sarah is not at work she is running a very busy household being the school bus & taxi for 2 children. Sarah likes nothing more than an afternoon in the sun with the latest gossip mag & a chilled wine. Glenn's role within RBEL is the electrical estimator & project supervisor. Glenn is a qualified electrican with over 20 years experience within the industry, training as an apprentice on large residential projects. Glenn has also travelled the world on his OE working in a number of countries within the electrical industry. Glenn is a Smart Vent Approved Installer & has a great passion for delivering solutions to customers.